It’s not unusual for backpackers to never return home to live. Australia’s migrant population is testament to that. But, what is unusual is when they undergo a significant metamorphosis in such a short period of time that results in them just wanting to make their young sons proud. Some of you might already know Euan. He’s a buyers’ agent and valued member of Propertyology’s team and has helped the firm’s clients buy dozens of properties in the past two years. If you have ever spoken to him, you will also know that he is Scottish – his enticing accent being part of the reason why the interview for this story went much longer than it really needed to. But, it was Euan’s Scottish upbringing that was to have a profound effect on the rest of his life. You see, his parents were hard workers and they taught their children to be the same way. They also were property investors. “My family owned a farm and dad was in forestry and wildlife. They were very hard workers, coming off the land. They started investing in property straight away. They would’ve been in their late-20s by the time they’d paid off their first house,” Euan says. “I could see that investing in property was something that I was interested in from an early age. I could see the wealth creation that they were starting to build. “I’ve always been taught to save and plan ahead for your future – that was instilled in me, as was work ethic to make sure that you’re being smart with your money as well as working hard towards your goal.” Euan spent his formative years in Scotland, where he completed a degree in sports science. Then, like so many of his countrymen and women, he stuffed some clothes in a backpack and headed to the other side of the world. Euan was 24 when he landed in Australia and didn’t have many plans, apart from playing rugby league in Wagga Wagga and probably getting up to some mischief as well. Then, in a decision that would ultimately change the course of his life, he drove north to Brisbane in late 2009.“ I travelled up the coast in an old beat-up 1993 Ford Laser that I bought for $500,” he recalls. Within a month of landing in the Sunshine State, he’d met his future wife, Ainsley, and a few months after that they moved in together. “When I moved in with Ainsley, I had a washing basket full of clothes, my kilt and a backpack, so I was a great catch,” he laughs. Euan’s personal life may have been on the improve big time, but the same couldn’t be said of professional life. Over the next few years, he worked in health and fitness, air conditioning and then landed a lucrative role in mining in 2011 during the resources boom. But it was also fly-in-fly-out which wasn’t ideal for a burgeoning relationship – and less so once the couple decided to get married and start a family. Yet it had its financial upsides. “We saved very hard and it only took us probably six to eight months and we’d bought our first house in April 2012,” Euan says. It was a four-bedroom, two-bathroom, nearly-new home in Brisbane’s northern suburbs. The location was selected because it was near friends and family. Euan says he understands now that he was like most first homebuyers – buying where he felt comfortable. “It was very much that DIY approach,” he says. By 2015, the couple had welcomed their first son, Flynn, which prompted Euan to leave his mining role without much idea about what came next. He wanted to make a career move and decided that real estate was the profession for him. He briefly tried his hand in a sales role but found it didn’t suit his ethics. He’d also been following Propertyology for a while and set his sights on securing a job with the firm. “I pursued Simon [Propertyology’s MD]. I applied for one role but didn’t get it. Simon probably took one look at my CV and thought who is this guy? But the person that I am means I didn’t give up and I applied again, but I didn’t get that one either,” he says. Euan’s “never say die” attitude, however, meant that by mid-2015 be was invited to meet Simon and the Propertyology team. It was another turning point in his metamorphosis it seems.“I wasn’t looking for a job. I was looking for a career move. At that time, having a first born, it was very much about that and about getting my teeth into a career that I could really drive – the sky’s the limit kind of thing – and Propertyology was that for me,” he says. While he admits it was a steep learning curve, he says he was like a sponge and also found that the firm’s ethos of putting client’s best interests first suited his morals to a tee. Within a year, Euan and Ainsley set their sights on becoming investors, too, but their first property purchase wasn’t producing the equity love they needed. “I was keen to get going as soon as possible. The market in north Brisbane had really not done much since 2012. It just bumped along with very minimal growth,” he says. 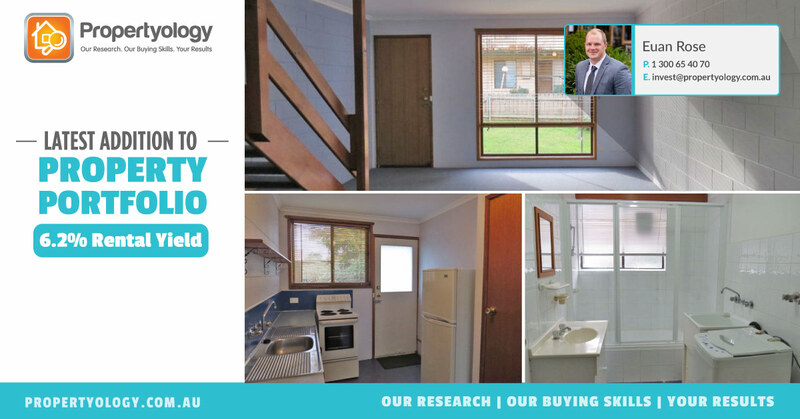 As it turns out, their new property was in a location that Euan knew very well – he’d helped clients buy properties in that particular pocket of an affordable capital city many times over in the past year. They bought an “ugly duckling” property in an attractive pocket prior to it going to market. It’s a two-bedroom split-level townhouse that they secured for $225,000. Its weekly rent is an impressive $270, which meant that the property is neutral to positive – even though the couple borrowed 95 per cent to finance it. “All up I used about $30,000 of our own money. I was trying to keep that ‘head on the pillow at night’ money and tried to find a good quality property that would demand a fairly healthy return,” he says. Four days after the property settled, the couple’s second son, Grayson, was born. Euan says that he used the same investment strategy as well as third party service providers that the firm’s clients use so it gave him a unique insight into the process. “I was going through the exact same process. It was a good learning experience as well and then I could apply that to having empathy and understanding of what clients are going through – having several tasks to perform each day and relying heavily on the guidance of those third-party service providers,” he says. Considering Euan turned up in Australia eight years ago as a single backpacker who played rugby league and whose possessions consisted of a $500 car, his kilt and a washing basket full of clothes, it’s fair to say that he’s living a very different life today. He’s married with two small sons and has two properties under his belt at 32. The couple wants to continue to invest, but like so many young families, cash flow is an issue when you’ve gone down to one income. “Going forward, I want to be as aggressive as possible, take the bull by the horns, make my own decisions, not just sit on the fence and worry about what APRA or interest rates will do. At the end of the day, they’ll do what they’ll do,” he says. Getting Results With Expert Knowledge, Patience & Professionalism.